Marsh Supermarkets - Indiana/Ohio chain. Submitted by TheProf on Sat, 10/16/2010 - 12:02pm. 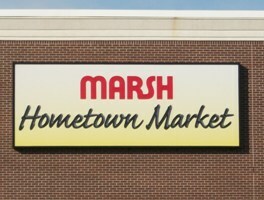 Headquartered in Indianapolis, Marsh operates 98 Marsh Supermarkets and 3 O'Malia's Food Markets in Indiana and Ohio. Marsh is to Indiana, what Jewel/Osco is to Chicago and Illinois area.